It's a bit sad to leave Ludwig, Rolli and the rest of the Stahlratte crew behind as we take a short dinghy ride to shore with our bikes and kit. Riding into the old town of Cartegena, the very first Colombian to talk to us is a guy who jumps out in the road offering us drugs! Welcome to Colombia - good to see all the old stereotypes alive! The town centre is carnage with narrow streets thronging with hoards, all weaving in and out of hand carts and yellow taxis that blare horns incessantly. We ride the wrong way up a couple of streets to a hotel where some of the others from the boat are staying; but it is full. I'm sure I didn't buy any drugs off that guy, but I must be hallucinating when we see a guy dressed as a horse throwing high-kicks at a group of passing school children. They scream and squeal in delight running out into the traffic choked street. Later we hit a reggae bar for some live music. We leave at around 1:30am but some of the others see the dawn in... Cartegena is a party town. 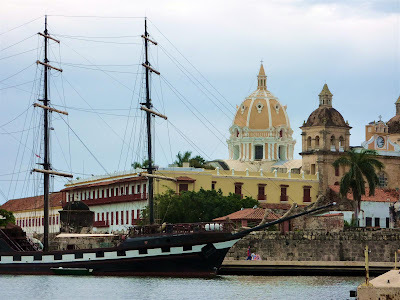 There are some excellent museums in town and we head to the Naval Museum next day which has a history of the Spanish conquest displacing the local tribes in this area. The main room has some fantastic models of the ongoing struggle to defend the city during the 16th to 18th centuries. The treasure hoards of Peruvian silver attracted increasingly more determined fleets from Britain and France (including Sir Francis Drake) who often carried out pirate raids rather than risk outright war closer to home. 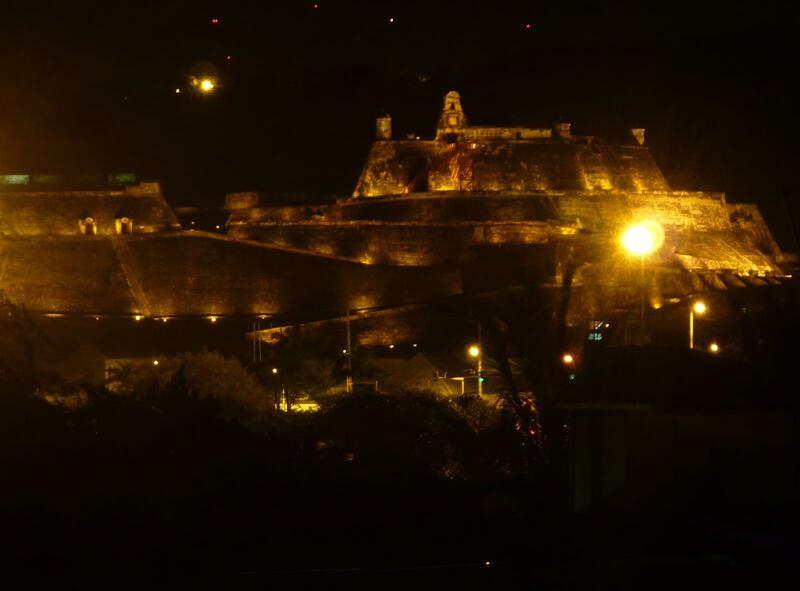 There are descriptions of the battles and a timeline for the building of ever more elaborate defensive walls and forts around Cartegena. They obviously cater to a different budget than ours so we head back to the cheap seats and find a bar doing an excellent curry. Oh I do miss a good curry! After that we head on to a Salsa bar and meet up with the crew and our Stahlratte ship mates again. On the last Sunday of the month, most city attractions are free so we head en-masse up to San Filipe Fort to see the canons and imagine battling scurvy sea dogs come-a-plundering! It's all a little hard to imagine with all that modern skyline in the background though. The Fort itself is impressive with tunnels running like an underground warren, but as a museum it is not. There is no information of any kind and it definitely pays to visit the Naval Museum first. You can imagine how the Spanish must have felt when they washed up on shore amongst all this wealth! There is a film about the "Zenu" - an inland tribe that built vast canal networks over a 2000 square mile area to control river flooding around 2000 years ago. They slowed the advancing water and used the river and it's silt to irrigate and fertilise vast tracts of land. It is a feat that is beyond modern engineers and parts of Colombia's central valley suffer from uncontrolled flooding today! Plaza Trinidad is a local's hangout and the boat crew head down for Sunday nights. There is a 5 piece band just jamming and they are really, really good. A stilt walking dancer joins them followed by a juggler with flaming torches. There are street carts laden with food and the local shop sells cold beer which you can carry out - it's a really chilled atmosphere. You feel a bit like a cork bobbing uncontrollably high in the water and you just can't move. There are 'helpers' who push you into place where, if you are still, you hardly feel the mud at all and you get this weird sensation of floating in space. If you do try and move, you get a strange feeling of overbalancing as your body flails about and you start to roll forward. Mud does not taste good! Your skin does feel amazing afterwards though and you can get a massage for about $1.50. Next it's off to the lake to wash off and there are washer women who are more than happy to help. You have to be quick to stop them whipping off your shorts underwater and giving you a good rub down! We return via a golden sandy beach where a fish lunch awaits us. Cartegena is alleged to be the most beautiful of all Colombia's cities and I can well believe it. It's not just the buildings either, the people are warm and friendly as well. True, in some parts of Getsemeni after dark it can get a little edgy and there are whispering spivs on many of the street corners, all 'trust-me' smiles and shifty eyes. Mobile phone attached to ear, they promise they can get you anything..... ANYthink (nod, wink....). But alongside the more 'adventurous' side of life, it's also a place where you could spend a couple of hundred dollars a night in a boutique hotel and dine in fine style in an expensive gourmet restaurant then stroll amongst the walls looking at the ocean and admiring the incredible architecture. It's a real mix! You could spend days just wandering here. There are numerous old plazas, churches and municipal buildings, plus the street scenes are vibrant and chaotic and ever changing. already got the domain name and concept, but am pricing web designers and want to know whats normal pricing for a site with no flash, ninety percent video content, homemade, amateur stuff, niche market with a forum, blogs, members area, email and ccbill ive been quoted everything from three hundred bucks to seven thousand.